Looking for Florida child support forms? Many of our website visitors have asked for a listing of the different support forms available for download on the Florida courts website. The titles of the child support forms are nice enough, but a brief description of each one is better. Several court approved forms are available for the self represented Pro Se filer. Choosing which ones are right for you is only half the battle. We guide you through each of the several Florida child support forms available with brief descriptions of each form. Find out if you are eligible to use a form and take a look at our web powered instructions to some of these forms. We've provided a convenient table for the most asked for forms, just select from the table below for the Florida child support forms you may need. You'll find the forms downloads, interactive forms, self-help guides, and our web-powered instructions for most of the forms. Be sure to read the instructions in their entirety to be sure they are the right forms for you. The first thing you should do is read the General Information for Self-Represented Litigants Guide, published by the Florida State Courts. In it you'll find descriptions of the legal terms and a guide on how to use and fill out the approved forms. The guide also covers family law procedures, how to communicate with the court, how to file your child support petition, a description of what "service" means and how and what forms of service are available. You will also find a comprehensive explanation of the different portions of the forms, what they mean, how and where to fill in your information, and a discussion of each section of the forms you will encounter. A court can reduce, increase, suspend, or stop your child support payments if there has been a "substantial change" in your circumstances after the court ordered you to pay. A substantial change in circumstances is anything affecting your income or the child's need to receive child support. For example, if you lose your job; your employer cuts your salary; you have a dramatic increase in expenses; a prolonged illness; the children become adults (emancipated); the time-sharing or custody arrangement has changed, etc. One or more of these kind of events may be considered as a "substantial change" of circumstances that can qualify for a change in child support. For many, the Florida Child Support form they need to begin this process is the Supplemental Petition to Modify Child Support. Modifying an existing child support order is generally done by using a Supplemental Petition to Modify Child Support, Form 12.905(b). 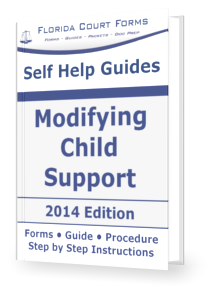 We also have a comprehensive self help guide covering child support modifications. This form was formerly known as the Supplemental Petition to Modify Custody/Visitation and Other Relief. Form 12-905(a) should be used when you are asking the court to change current court-ordered parenting plan or time-sharing schedule. If you and the respondent are unable to agree a judge will decide for you as part of establishing a Parenting Plan. The judge will decide the parenting and time-sharing arrangements based on the children’s best interests. Regardless of whether there is an agreement, the court reserves jurisdiction to modify issues relating to the minor child(ren). The judge may request a parenting plan recommendation or appoint a guardian ad litem in your case. Because a substantial change in circumstances often requires more than just a change in child support, many find this is the Florida child support form that they need. The court may order one parent to pay a certain amount of child support to assist the other parent in meeting the children’s material needs. Modifying an existing custody, visitation & child support order is generally done by using a Supplemental Petition to Modify Parenting Plan/Time-Sharing Schedule and Other Relief, Form 12.905(a). We also have a comprehensive self help guide covering custody, visitation & child support modifications. When unmarried parents are involved, it is essential that paternity is established before child support can be ordered and enforced. There are several ways that paternity can be legally established. The voluntary signing of the child's birth certificate at the hospital is the most common way for the legal establishment of paternity in Florida. Another way to establish paternity is to have the court order scientific paternity testing. Not immediately considered as a Florida Child Support form, this procedure is handled through the Petition to Determine Paternity and for Related Relief (see below). Once Paternity is established (through scientific paternity testing if necessary) then the "Other Relief" part of this petition can include the establishment of child support as well as time sharing and parental responsibility. Have a look at our Florida Petition to Determine Paternity & Other Relief web-powered instructions page. These pages make it easy to prepare your divorce paperwork online. They include links to all the supporting forms and to the applicable Florida statutes. FAMILY LAW FORM 12.904(a) may be used to ask the court to enter a support order if you and your spouse are separated, and your spouse has the ability to contribute to you and your minor children, but has failed to do so. You can only use this Florida child support form if a dissolution of marriage has not been filed and the children live primarily with you. If a petition for dissolution of marriage has been filed, you should file a Motion for Temporary Support with Dependent or Minor Children, Family Law Form 12.947(a), instead of using this petition (see below). Also, if you are requesting that an order be entered for you to pay support to your spouse, you should not file this form. This petition cannot address the issues of property, debts, custody, or visitation. It only deals with alimony and child support. Go to our Florida Petition For Support Unconnected With Dissolution of Marriage web-powered instructions page. These pages make it easy to prepare your divorce paperwork online. They include links to all the supporting forms and to the applicable Florida statutes. (2) the petitioner in a pending action for support unconnected with a dissolution. For you to use this form, a petition for support unconnected with a dissolution of marriage must have already been filed. You should use this form to ask the court to award temporary spousal support (alimony) and/or temporary child support. Download the Motion For Temporary Support With Dependent or Minor Children, Family Law Form 12.947(a) from the Florida Courts website. Family Law Form 12.903(e) should be used when you are responding to a supplemental petition for modification of custody or visitation, child support, or alimony. This Florida child support form is used to admit or deny all of the allegations in the supplemental petition if you do not plan to file a counterpetition. The Florida Courts website does not provide for a counterpetition to a supplemental petition in these Family Law Forms. If you want to file a counterpetition to a supplemental petition you will need to either seek legal assistance or create a form yourself. Our Petition Preparer Service can create one for you to your specifications. Just ask us for a Free Quote. You may construct an answer and counterpetition using the pertinent sections contained in the Answer to Petition and Counterpetition for Dissolution of Marriage with Dependent or Minor Child(ren), Florida Supreme Court Approved Family Law Form 12.903(c)(1), or Answer to Petition and Counterpetition for Dissolution of Marriage with Property but No Dependent or Minor Child(ren), Florida Supreme Court Approved Family Law Form 12.903(c)(2). 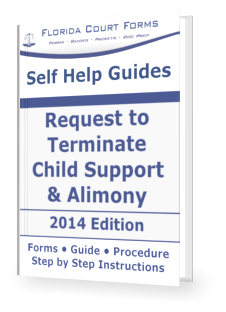 The Florida Court Forms Self Help Fully Interactive & Complete Forms Packet for Request to Terminate Child Support or Alimony. All forms are interactive and properly formatted in PDF and includes a filing procedure, links to websites, important addresses & phone numbers, and much more. The Self Help Packet includes easy to follow step by step instructions, all the required & supporting forms, filing procedures & checklists, important links and resources, easy to understand and written in plain English. Order the Packet instant download or use our Petition Preparer professional documents preparation service. Your documents will be in your hands and ready to file at the courthouse in 3 days or less! We guarantee our work.